The islands of the Atlantic Ocean created by the volcanism of the Mid Atlantic Ridge are The Azores, Bermuda, Madeira, The Canary Islands, Ascension, St. Helena, Tristan da Cunha, and others. The divergence of the ridge started in the north about 150 million years ago and 90 million years ago in the south. Iceland is the largest island on the ridge because of the additional volcanism caused by the hot spot under the country, which moves slowly towards the northwest across it. These unique circumstances on the ridge probably are the reason for the country’s existence, because the tectonic movement of the plates and the related volcanism would not have sufficed. The country probably would have looked very differently if the hot spot were the sole reason for its creation, probably something similar to Hawaii. The plate tectonics move the plates apart, towards east and west, and both the North American- and Eurasian systems move to the northwest across the hot spot. It is possible to trace the tracks of such hot spots because the plates move across them like steel plates across a fixed blowtorch flame. On top of the hot spot is a 20-100% molten layer at the depth of 5-20 km, which supplies more than sufficient material for eruptions. This hot spot causes eruptions within the southern volcanic zone including volcanic systems such as Mt Hekla, the Westman Islands, Katla, Mt. Eyjafjallajokull, Mts Tindfjoll, the Laki Area, the Fishing Lake Area, and the western sub-glacial part of the Vatnajokull area. This volcanic zone has gradually moved to the southeast from the present Graben, or the continuation of the Mid Alantic Ridge across the country. The lateral rift system (flank zones) across the Snaefell Peninsula and the Huna Bay ceased being active about seven million years ago. About 60 million years ago, when it was active, it was situated near the present Faroe Islands and Eastern Greenland where it left basaltic regions and submarine ridges in both directions. The present centre of the hot spot lies under the Trolladyngja shield volcano, where it reaches depths of 275-375 km and probably stretches underneath the mainstay of the Vatnajokull and Hofsjokull regions. The largest volcano and caldera of the country are probably contained under the ice cap of the Hofsjokull glacier. Magma reservoirs with 100% molten lava and areas of 100-1000 km³ are present at the depth of 10 km under the volcanic zones (the Graben), and they feed the shallower and smaller magma chambers under the central volcano systems. The shape of those magma reservoirs is rather obvious on the surface, such as under the Krafla system, where it is situated at the depth of 3 km and above it the magma chamber at the depth of about 700 m. Mt. 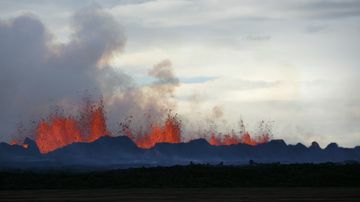 Hekla does not have any magma chamber, but the magma reservoir under the volcanic system is estimated to be at the depth of 8 km and about 40 km long. Chambers usually are 10% of the size of reservoirs. When the Krafla system erupts, the magma chamber feeds it, but eruptions of the Gjastykki system, further north, are fed by the deeper reservoirs. Approximately 10% of the structure of the country consist of rhyolite, dasite and other acid rock types. The most common type of basaltic rock is thoelite, which is divided into many subtypes. The Ice Age ended about 9000 years ago. The 3 million years long Ice Age was divided into 30 glaciation epochs of almost 100.000 years, and about 10.000 years long warmer epochs between them. The age of the basaltic strata from west to east is 16 – 10 million years. Eight central volcano systems are recognizable by light coloured rock types (gabbro) and high temperature systems. The structure of the island Hrappsey on the Breidafjordur Bay is anorthosite, the light coloured type of rock on the moon (the other type is norite). When oxygen was first produced as a waste product by certain plant cells some three billion years ago, it created a crisis for all other life on earth. Those plants were polluting the environment, exhaling a lethal gas. Earth eventually had an atmosphere incompatible with life. Nevertheless, life on earth took care of itself. In the thinking of the human being a hundred years is a long time. Hundred years ago we didn't have cars, airplanes, computers or vaccines. It was a whole different world, but to the earth, a hundred years is nothing. A million years is nothing. This planet lives and breathes on a much vaster scale. We can't imagine its slow and powerful rhythms, and we haven't got the humility to try. We've been residents here for the blink of an eye. If we're gone tomorrow, the earth will not miss us.